You'll find all the answers to your questions. What are the opening hours of Reprotec ? Our business is open 24/24 for printing, but our delivery service and hotline is available from 8:00 a.m. to 5:00 p.m. on weekdays. How to print the plans with Internet ? 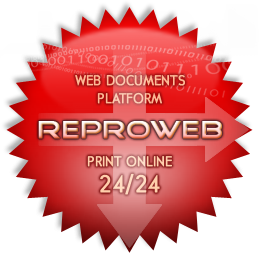 You can print your plans 24h/24 through the digital printing platform Reproweb. To do so press the link "Reproweb" on the left of the page. What are the strengths of Reprotec ? Choose the print quality that you want ! The extremely short delivery times !